Worthington Assembly is a manufacturer in a little town in western Massachusetts called South Deerfield. We make stuff. Mostly circuit boards. But also anything else that needs to go with that circuit board. Worthington Assembly is the exclusive manufacturing partner for CircuitHub. CircuitHub enables you to get an instant quote for your project including the bare boards, components, tooling, and assembly. If you're using Altium, Eagle, or KiCAD you can use CircuitHub. For most projects that have limited complexity, CircuitHub should be your first stop. If your project is a bit more involved, you can work directly with us. Feel free to shoot us an email at info@worthingtonassembly.com or give us a call at (413) 397-8260. We have a world class SMT assembly line. Even though we are small, we are prepared for anything; Double-sided, flipchip, PoP, 0.3mm fine pitch IC's, BGA's, you name it, we've seen it and we can handle it. Nearly every single circuit board we assemble has thru-hole components in addition to surface mount components. Some things still require an old school thru-hole component. Yup, we do box builds. It's pretty rare that a circuit board gets used as is. Oftentimes it needs to be put into a case and connected to some wires somehow. Many of Worthington Assembly's customers aren't really interested in hiring and managing a bunch of interns to do this for them. They'd rather just focus on what they're good at, designing a product. 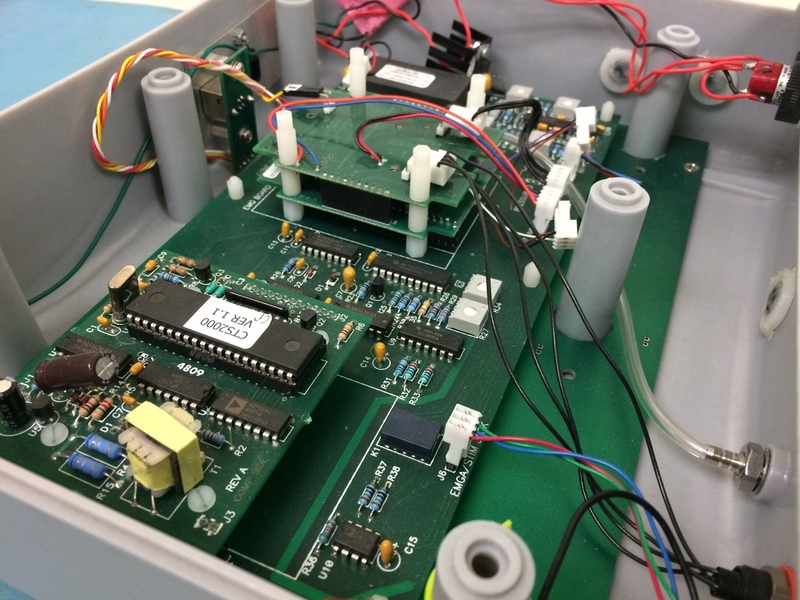 While Worthington Assembly has specialized on their ability to produce circuit boards, we recognize that most circuit boards need to connect to something. And even in this world filled with Bluetooth Low Energy and WiFi modules, sometimes you still need to wire things together with good old-fashioned copper. Does your design have a chip that needs programming? We can take care of that. Depending on how many assemblies you would like, we can probably even automate the programming of your chips. This can be a huge time and cost savings. Even if you only have a few devices, we can still load your code for you. Sell a bunch of stuff on Kickstarter and now have no idea how you're going to ship everything to your backers? Yeah, you're not the first. We've worked with a lot of customers who've done much better than they expected with their crowd-funded project and then feel overwhelmed by their own success. Don't worry. We can figure this out. Sometimes you need something assembled that is really out of the ordinary. We call these odd-form assemblies. We do them all the time and some of the odd-form assemblies we handle are our highest volume products. Many of our customers need their circuit boards conformally coated to protect them from the elements. There's a considerable amount of effort involved in coating a circuit board with this protective coating. But Worthington Assembly has a lot of experience doing this and would be happy to take a look at your application. We are a really small team but we have a really big reach. This is just a sample of many of the locations we have shipped to. Thank you so much the superior effort you put forth to get us the latest board in such a expedited fashion! The entire process from firing off the order to handing us finished assemblies was 6-days - this is a record in our book! Having all the players and forces align, along with some good luck, means I have a lot more time to debug and test firmware. Although we always hope to operate our supply chain on a less hectic schedule, it’s really nice to “know what she’ll do” when called upon!